1. Pour cornflakes into a Ziploc bag, seal and crush flakes well. Pour cornflake “crumbs” onto a plate. 2. Crack eggs into a shallow dish or wide shallow bowl and beat together with milk until well blended. 3. Pour olive oil into a frying pan and heat over medium-low heat. 4. 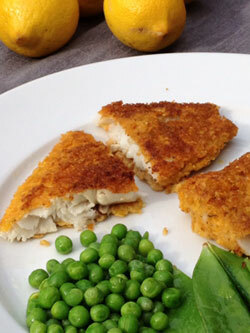 Sprinkle or rub each fish fillet with some seasonings on both sides. 5. Dip fillets into egg wash and then dredge in cornflakes and immediately place in hot oil in frying pan. I have never liked tilapia until now! This recipe was a hit with the kids too. So delicious and so easy. Thanks for the great recipe. I am going to try your BBQ chip salmon next.